"Designed to make great tasting iced tea fast, you’ll be sipping in under a minute." "Great for crowded kitchens...made from food-safe stainless steel and designed to fit any wide-mouth Mason jar." "Just as easy to use as one of their coffee makers and a great option if you want an electric brewer." "The carafe is made from borosilicate glass, the infuser is food-grade stainless steel, and the seal is silicone." "Convenient for travel, easy to brew at home, and just plain fun to use." "Holds a whopping two gallons...a stainless steel spigot for easy dispensing from the refrigerator or while perched on a picnic table." "With three different cores, you’ll always have a use for this attractive drink pitcher. " Designed to make great tasting iced tea fast, you’ll be sipping in under a minute using the Takeya Flash Chill Iced Tea Maker. It holds 2 quarts, so you’ll be able to drink tea all day or have enough to serve all of your friends at the barbecue. You can use this one with either loose tea or teabags as well. That's a nice feature if you really enjoy exploring tea and don't want to be bound to one form or the other. To make your tea, just put the loose or bagged tea into the infuser and attach it to the lid. Fill the container halfway with hot water and let the tea steep to your desired strength, then remove the infuser, add ice, and shake for 30 seconds. The Tritan plastic can handle the heat, and it won’t be damaged by the sudden chill or the shaking. The lid is leakproof, so you won’t make a mess when shaking. This also allows you to store the container on its side if your refrigerator is crowded and there’s no space on a shelf or on the door. You can also toss it in a bag to take along to a picnic, with no worries about spilling. Great for crowded kitchens, you won’t need to find space to store another large container when you use the Monument Home Cold Brew Infuser Filter. It’s made from food-safe stainless steel and designed to fit any wide-mouth Mason jar or any other container with an opening of that size. Just make sure your jar can handle the heat if you’re starting with hot liquid. Since you’re using your own jar, you can make pints, quarts, or half-gallons of tea, and you can use loose-leaf tea or put tea bags into the filter so they’re easy to remove after brewing. Make hot tea and serve it over ice or make refrigerator tea overnight, either way works great. This isn’t a one-trick pony, though. You can also use it for cold brew coffee or to infuse fruit flavors into water or alcohol. Mr. Coffee has crossed over to the tea side with the TM1 2-Quart Iced Tea Maker. Of course, it’s just as easy to use as one of their coffee makers and a great option if you want an electric brewer. This tea maker can handle either loose tea or tea bags and makes up to 2 quarts of tea in just a few minutes. 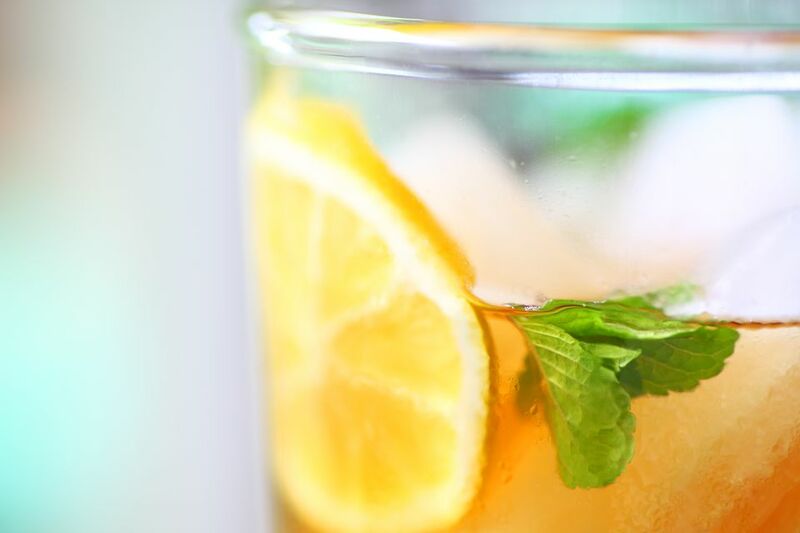 Simply fill the pitcher with ice for chilled tea right away, or refrigerate the brewed tea for later use. It has an automatic shutoff after brewing is done, so you don’t need to watch it. The brew basket is removable for easy cleaning, so your tea flavors won’t mingle, and the machine has a cleaning cycle to keep itself clean without any fuss. While this one is designed for brewing iced tea, you can also use it for brewing iced coffee. These days, a lot of people are trying to avoid using plastics in the kitchen. If you fall into that group, you'll love the Ovalware Airtight Cold Brew Iced Coffee Maker and Tea Infuser. The carafe is made from borosilicate glass, the infuser is food-grade stainless steel, and the seal is silicone. Cleaning is easy since all parts are dishwasher safe and they won’t retain odors preventing your green tea from tasting like the mint tea you brewed last time. The glass is heat-safe, so you can brew the tea hot and pour it over ice, or you can make the tea in the refrigerator overnight. The seal is airtight and leakproof, ensuring your brew will stay fresh in the refrigerator and you don’t need to worry about spills if it tips. The filter can handle either loose-leaf teas or tea bags, and you can even use this for cold brewing coffee. The large handle is easy for anyone to grab, and the spout makes pouring easy, while the beaker design looks sleek and modern. Measurements along the side let you add a precise amount of water or other liquid when you’re following a recipe. Convenient for travel, easy to brew at home, and just plain fun to use. Guests will love watching the magic happen with the igenuiTEA Teapot from Adagio Tea. All you have to do is add your loose-leaf or bagged tea to the pot, then add your hot water and let it steep. Have a mug or glass waiting and fill it with ice for iced tea. Place the teapot on top of your glass and watch the tea drain from the bottom, leaving the tea leaves behind. To stop the dispensing, just lift the pot off of the mug, and the flow will stop. This makes it very convenient to serve several people from the 28-ounce teapot, or have several cups for yourself. Since the tea simply floats in the pot rather than being contained in a filter at the top of the pot, you add more tea for a stronger brew or fill the pot with less water to make a single cup. If you prefer an overnight tea, simply mix tea leaves with cold water and let it steep overnight in the refrigerator. The wavy-shaped handle is a perfect fit for fingers, offering a cool, secure grip. It is also dishwasher safe for easy cleaning, and for more thorough cleaning, the filter snaps in and out and the lid is removable. If you tend to make smaller batches of tea or you travel alone, a 16-ounce pot is also available. Sometimes a few glasses of tea is simply not enough. This large glass jar from RPI holds a whopping two gallons. It also has a stainless steel spigot for easy dispensing from the refrigerator or while perched on a picnic table. To make it even better, it has a filter over the spigot that will catch any errant bits of tea leaves. However, it is best to use tea bags. Let the tea brew overnight, remove the bags, then add ice, berries, or other fruits, if you desire. The lid clamps on tightly to prevent spills while you transport it to the backyard. It also keeps flying critters from drowning in the drink. When you’re not using it for tea, you can use it for dispensing other beverages as well. The spigot is removable for thorough cleaning, and a replacement spigot is included, so you’ll always have a spare. With three different cores, you’ll always have a use for this attractive drink pitcher. The Primula Flavor It Infuse Pitcher is fantastic and its uses go far beyond iced tea. One core has small holes that makes it perfect for all of your loose-leaf teas. One has larger holes that allow easier flow of water when you're using tea bags or fresh fruits. The third core is for keeping your drinks cold without diluting them. Just keep that core in the freezer, so it's ready when you need it. This pitcher is made from Tritan plastic that's durable, heat-safe, and attractive for serving drinks at any party. The container is designed to fit on the shelf on the door of most refrigerators, so it's easy to store and easy to find when you need a chilled drink. No matter how big or small your hands are, the large handle is easy to grab. It also has a silicone insert for a more secure grip when you're carrying a full pitcher. The top locks into place to prevent accidental spills, and you can even store it on its side if your refrigerator is too full. For easy cleaning, the pitcher and all of the parts are dishwasher safe, so you'll be sure your herbal teas don't flavor your green tea.